Okay, it’s the first day of Finals Week here at the University of Colorado, so let’s make this a quick one and start with the part of today’s movie everyone remembers and adores, the one element that, above all else, has made this Rankin Bass special a TV classic: Snow Miser and Heat Miser. Are there any two more beloved characters in the Rankin/Bass universe? There certainly aren’t any more creative – two weather deities so narcissistic they’ve hired and trained choirs to sing about them, but still petulant enough to have a petty sibling rivalry and remain afraid of their mother. Awesome. The Miser brothers aren’t just the best part of this TV special; they are two of the most memorable stop-motion characters of all time. Do most people even remember anything else about this special? I quite like it, but I’ll be honest…unless I really think about it, I have trouble remembering everything unrelated to the Miser Brothers. Something about Santa, right? And that, my friends, is why “The Year Without a Santa Claus” is a classic. There. I’ve discussed the Miser brothers, and done my critical duty. I’m going to get back to studying now….but......oh, alright, we’ll talk about this one a little bit more. “The Year Without a Santa Claus” isn’t as highly regarded or iconic as “Rudolph the Red-Nosed Reindeer,” “Santa Claus is Coming to Town,” or other Rankin/Bass classics, but it’s one of my favorite Christmas specials. It doesn’t follow the pattern of other Rankin/Bass classics; instead of fleshing out a song to an hour-long plot, “Year Without a Santa Claus” tells an unfamiliar story (albeit adapted from a book), one with an irresistible premise: Santa catches a cold and, coupled with his belief that there’s not enough ‘Christmas spirit’ out there, decides to take a holiday. Mrs. Claus won’t have it, so she sends elves Jingle and Jangle out into the world to find people who believe in Santa and the spirit of the season. Not all goes according to plan, of course, and the elves get stuck in South Town, where there’s no snow and a distinct lack of cheer. Mrs. Claus gets an idea – if the people of South Town start believing, then Santa will certainly be inspired. She goes to the Miser brothers to broker a deal to get snow in South Town, while Santa himself travels there as a civilian to save the injured baby reindeer Vixen. It’s actually quite a bit more complex than other Rankin/Bass stories. The multiple plot threads increase the tension of the situation (such as it is), making us all the more invested in the story and characters, and the special even deals with some themes deeper than those found in most Christmas television. 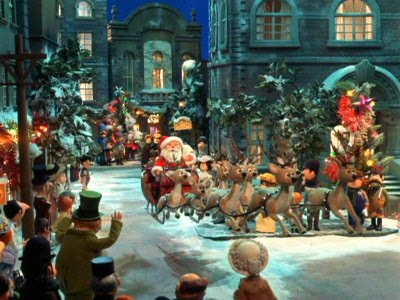 “Christmas spirit” is a common theme, especially within Rankin/Bass, but here, they tackle the issue more thoughtfully than ever before; South Town is a living, breathing community with characters we come to know and understand – it’s more than just an empty back and forth between two elves and a couple of grumpy kids. That adds a great deal of heft to South Town’s final surge of belief. The ensemble is great across the board, and while they might not be as memorable as characters in other Rankin/Bass specials, the vastness of the cast does give you more investment in the film as a whole. Mrs. Claus is a character rarely explored in these films, and as the one who has to go see the Miser brothers, she gets the best storyline. The film’s incarnation of Santa, a grown-up version of the character in “Santa Claus is Coming to Town,” is darker than in other Rankin/Bass specials; he’s developed a disillusioned attitude towards people, and lost interest in his job. Still, he’s a very nice man, and some of the best moments come from his attempts to get a young boy in South Town to believe in him (not unlike “Miracle on 34th Street”). 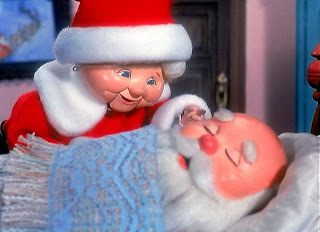 Mickey Rooney reprises the role from “Coming to Town,” proving that he’s one of the screen’s best Santa’s. There are some amusing elves and delightfully cute reindeer thrown into the mix as well, but, of course, it’s the Miser Brothers who steal the show. The first time one sees the special, their appearance is actually a big surprise. Mrs. Claus simply has to convince someone to make it snow…how hard could that be? And suddenly, she’s meeting with a charming, conspiring leader known as Snow Miser; the song starts, the talks begin…it’s gold. Solid gold! And then there’s heat miser, and his scene is just as good! Next, the two are together! By this time, I imagine a first-time viewer has to wonder if it can get any better. Well, it can’t. The entire special is very strong from start to finish, but let’s face it…the miser brothers sort of overshadow everything. But Miser brothers aside, I love this TV special for its advanced, unfamiliar plot and great set of characters. It has a special flavor to it that has never truly been replicated, though many films have tried. This one is a bit harder to find on DVD then the most iconic specials like “Rudolph,” but I’ve noticed a higher number of copies on store shelves lately; however you see it, “Year Without a Santa Claus” is a very fun Holiday tradition.